The Two Sugar Creek building was acquired by Velocis. 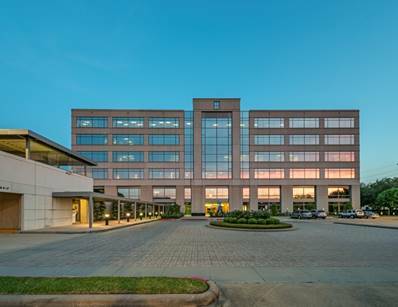 SUGAR LAND, Texas – Velocis, a Dallas-based private equity real estate manager, acquired Two Sugar Creek, a 143,000-SF office building on the southwest side of Houston. The seller, TA Realty, was represented by HFF. The six-story building, built in 1999, is located off of Dairy Ashford Road, near the intersection of U.S. Highway 59 and U.S. 90. It is 85 percent leased. Dallas-based Velocis has been active in real estate investment since 2011, purchasing 25 assets located in markets in Texas, Colorado, Georgia, Florida, Arizona, Virginia and North Carolina. Velocis is led by a team of five seasoned principals who are directly responsible for the acquisition, asset management and disposition of assets. Principals in Fund II are Fred Hamm, Mike Lewis, David Seifert, Paul Smith and Jim Yoder. Stream Realty will manage and lease the Sugar Land building.